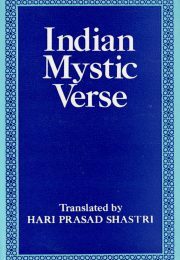 Indian Mystic Verse is a collection of 300 poems, by 42 poets, written in Hindi, Urdu and Persian, in the region of the Indian sub-continent and what is now Iran, between the 12th and 20th centuries. They have been translated into English by Hari Prasad Shastri, who himself composed and published poetry in several languages. Some of the poets represented here, such as Hafiz, Harischandra, Kabir, Tulsidas and Surdas, are well-known to scholars and popular audiences. Others are much less easily available elsewhere. The poems have been selected for their literary quality, and mostly for the value of what they express for people seeking guidance and support on the way to inner illumination. The traditional teachers of non-duality have left detailed writings in the form of practical instructions and philosophical exegesis. Yet some aspects of the teachings may be most effectively expressed in poetry. A number of the writers in this collection wrote both practical and philosophical prose works and poetry. Pass before Thee again and again. There is no change in Thee. Thou seest nought but Thine own reflection. So dost Thou forget that this world is but Thy dream. Thy distress is Thine own illusion. Indian Mystic Verse will be of interest to those who appreciate mystical literature from a range of traditions. And for serious students of non-duality it may provide valuable insights, refreshment and recreation.